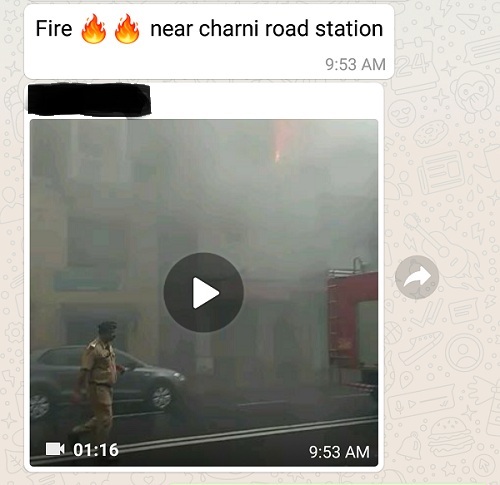 As heavy rains exposes Mumbai’s creaking infrastructure an old video of a fire is revived to create panic. Heavy rains have brought Mumbai to a standstill and given an opportunity to the fake news brigade to spread misinformation. 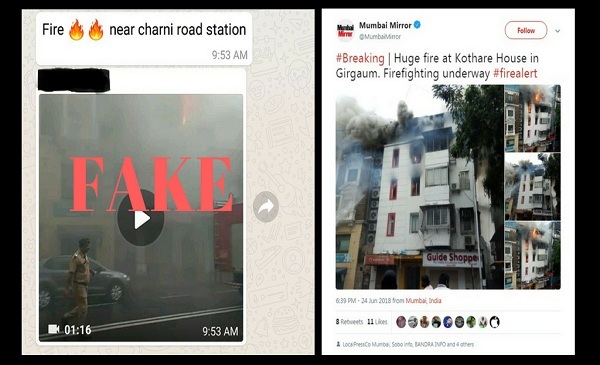 A video of a blaze at a building in Girgaum that took place on June 24th is being shared on WhatsApp and social media as a recent one. BOOM contacted Mumbai’s fire department control room, which rubbished the information as a rumour. The video shows a fire engine parked in front of a building whose two floors are engulfed in large flames. The video is going viral on WhatsApp and Twitter. 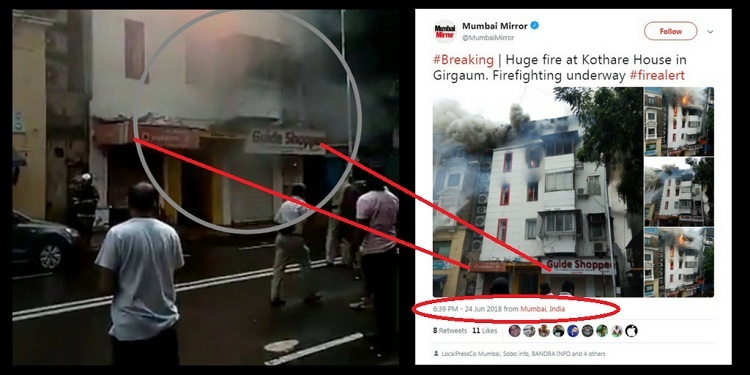 However, the video is from June 24 when a massive fire claimed one life and gutted two floors of Kothare House near Central Plaza Cinema in Mumbai’s Girgaum area. According to a news article in the Indian Express, the fire broke out in the second and third floors of the four-storeyed commercial building, which was largely unoccupied. A 28-year old man named Kabir Alam was killed in the fire. News report said the building had shops on the ground floor while a pre-school was being run from floors one through three. The fire occurred on Sunday evening limiting casualties. Eight fire engines, water tankers, an ambulance and a hydraulic ladder were deployed to the site, the newspaper reported. According to news reports the building was neither old nor dilapidated and the blaze appears to have been caused by a short circuit. In Mumbai’s continuing woes during monsoon, local train services on the Western railway line were suspended on Tuesday, as a bridge caved in at Andheri station, due to incessant rains in the morning.